Everyone has the problem in their internet connection. There’s no person on this planet who is not having trouble with establishing their new or existing internet connection. Therefore if you are having inconvenience with working around internet connection, here we are with some information regarding what’s with the internet connection and ways to fix it. that your most of the network complications come arise through unplugging the connection. This isn’t only just the case for twisted pair cables. If you have not paid attention in your Wi-Fi Access Point or DSL you are not getting any kind of internet service. By the same token, sometimes your Wi-Fi connection bothers you when it doesn’t sync with your device. So make sure that your PC or mobile set is pointing out or trying to connect to the right AP. Also, make sure that once you have changed the access password of the network, you need to change it on all of your devices. Now let us take you to your internet connection. The simple way you can do is unplug your DSL modem lid and put it back on after one minute. If you call your ISP, the more chances are they will ask you to do the same. Now let’s say your internet is back and running but not the way you wanted, it’s abandoning the work. The first thing you will need to do is check if you are getting the actual amount of bandwidth that you are paying for. You can check your current real speed online by Speedtest. You might be curious to know about your LAN, WAN, and VPN, we recommend you NSW IT Support subscription. The Speedtest site will aware you about what your ping is, the time it consumes from a single packet from your network to strike a host file and your download and upload speeds. You might anticipate the low ping number and high download and upload speeds. But that’s not the number the ISP’s delivers you. NSW IT Support guarantees the promising speed and number. Another irritating job pops up when your bandwidth looks just fine and have the low ping as expected but still good connection does not hang on with you. This may be the reason of losing the packets/suffering from jitter. The PingTest site could be useful here. Packet Loss is chiefly caused by the bad connection, interference and overburdened network hardware. During normal internet usage, the packet loss of 1-2% could be tolerating. However, when it comes to playing online games or video conferencing, the packet loss is unpleasant and heartbreaking. If you are encountering any of those, blaming your ISP will be the only option left for you. Just say that your internet is still slow. One of the many reasons could be if you are downloading large sized files from torrent or watching movies on Netflix. This consumes a lot of bandwidth of yours. Since during the evening times these works are in progress, you expect slow internet. ISP’s are having difficulty in delivering the exact bandwidth. Another reason behind getting limited internet from ISP could be handicapping your bandwidth from ISP itself. They limit and obstruct your bandwidth that ranges from 1 GB to 250 GB. 250 GBs are a lot. So, if it turns out that your ISP is the major reason behind your bandwidth restriction and making your internet usage tough, it’s time to find new ISP around you. 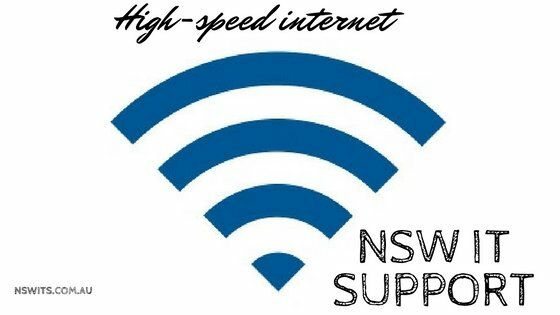 NSW IT Support is your trustable partner that provides the high-speed internet service. Excellent reliability – Our business internet services are totally reliable. You can count on our internet services to perform at optimum levels whenever you need it to. Affordability- At NSW IT Support, we believe in providing quality services within the budget of our clients. Hence, our business internet plans are priced reasonably to make sure you get the best internet service at an affordable price point.